The DArk Matter Particle Explorer (DAMPE, also known as Wukong) mission published its first scientific results on Nov. 30 in Nature, presenting the precise measurement of cosmic ray electron flux, especially a spectral break at ~0.9 TeV. The data may shed light on the annihilation or decay of particle dark matter. DAMPE is a collaboration of more than a hundred scientists, technicians and students at nine institutes in China, Switzerland and Italy, under the leadership of the Purple Mountain Observatory (PMO) of the Chinese Academy of Sciences (CAS). The DAMPE mission is funded by the strategic priority science and technology projects in space science of CAS. 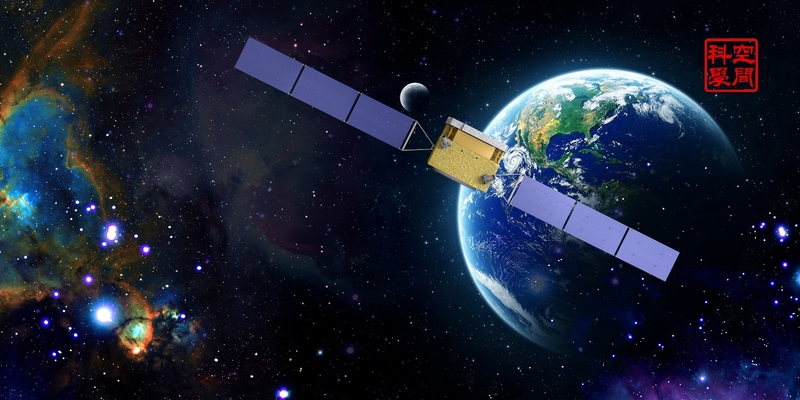 DAMPE, China’s first astronomical satellite, was launched from China’s Jiuquan Satellite Launch Center into sun-synchronous orbit on Dec. 17th, 2015. At an altitude of about 500 km, DAMPE has been collecting data since a week after its launch. 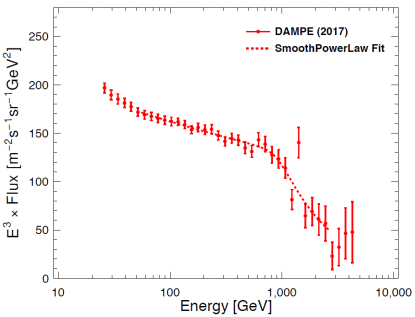 In its first 530 days of science operation through June 8 of this year, DAMPE has detected 1.5 million cosmic ray electrons and positrons above 25 GeV. The electron and positron data are characterized by unprecedentedly high energy resolution and low particle background contamination. Figure 1 shows the first published results in the energy range from 25 GeV to 4.6 TeV. The spectral data in the energy range of 55 GeV-2.63 TeV strongly prefer a smoothly broken power-law model to a single power-law model. DAMPE has directly detected a spectral break at ~0.9 TeV, with the spectral index changing from ~3.1 to ~3.9. The precise measurement of the cosmic ray electron and positron spectrum, in particular the flux declination at TeV energies, considerably narrows the parameter space of models such as nearby pulsars, supernova remnants, and/or candidates for particle dark matter that were proposed to account for the “positron anomaly” revealed previously by PAMELA and AMS-02, according to FAN Yizhong, deputy chief designer of DAMPE’s scientific application system. 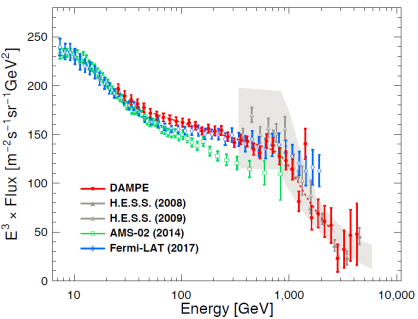 “Together with data from the cosmic microwave background experiments, high energy gamma-ray measurements, and other astronomical telescopes, the DAMPE data may help to ultimately clarify the connection between the positron anomaly and the annihilation or decay of particle dark matter,” said FAN. Data also hint at the presence of spectral structure between 1 and 2 TeV energies – a possible result of nearby cosmic ray sources or exotic physical processes. Yet, more data are definitely required to explore this phenomenon. DAMPE has recorded over 3.5 billion cosmic ray events, with maximum event energies exceeding ~100 trillion electronvolts (TeV). DAMPE is expected to record more than 10 billion cosmic ray events over its useful life – projected to exceed five years given the current state of its instruments. More statistics will allow more precise measurement of the cosmic ray electron and positron spectrum up to ~10 TeV. Scientists will also be able to explore spectral features potentially generated by dark matter particle annihilation/decay or nearby astrophysical sources, e.g., pulsars. Figure 2 compares the results of the cosmic ray electron and positron spectra from DAMPE and other experiments. The DAMPE results reported here demonstrate the unique capability of DAMPE to explore possible new physics and/or new astrophysics in the TeV energy window, thanks to its high energy resolution, large instrumental acceptance, wide energy coverage, excellent electron/proton separation power, and long working life. DAMPE’s first scientific result is a milestone for the international collaboration. The mission will continue to study galactic cosmic rays up to ~10 TeV for electrons/gamma-rays and hundreds of TeV for nuclei, respectively. DAMPE data is expected to reveal new phenomena of the universe in the TeV window. PMO, under the leadership of Principal Investigator CHANG Jin, proposed and led the initial design of DAMPE. The Plastic Scintillator Detector (PSD) was constructed by the Institute of Modern Physics, CAS. The Silicon-Tungsten tracKer-converter (STK) detector was jointly developed by the Institute of High Energy Physics, CAS, the University of Geneva (UniGE), and INFN Perugia. The BGO imaging calorimeter was jointly developed by the University of Science and Technology of China (USTC) and PMO. The Neutron Detector was constructed by PMO. The Data Acquisition System was made by National Space Science Center, CAS. The data analysis work of the DAMPE international Collaboration is the result of the scientists in all the participating institutes (PMO, USTC, IHEP, IMP, UniGE, INFN and University of Perugia, Bari, Lecce, NSSC). The scientific activities are coordinated by the ground Scientific Application System led by PMO, USTC, and UniGE, in a competitive but still collaborative effort finalized to the release of highest level scientific results.